Many people think that distance education is a recent phenomenon. But, the reality is that the history of distance education can be traced all the way back to 1728 when a man named Caleb Phillips advertised the first correspondence courses in the Boston Globe. In much more recent history, the first totally online-based school was launched in 1994 by CALCampus. They were the first to offer real-time classroom instruction, administration, and course materials, all online. We’ve come a very long way since the early days of mail correspondence courses and online education. Today, it’s estimated that more than 6 million students in the U.S. are taking at least one online course. More than ever before, universities across the United States and around the world are making online education an integral part of the learning experience. The University of Toledo is a leader in this area and is blazing new trails when it comes to distance learning and online education. By leveraging Echo360 to offer 400 online courses, adult, non-traditional students and even active duty military personnel serving all over the world have the flexibility to earn degrees. 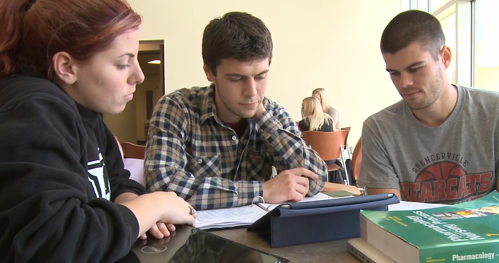 Core technology, provided by Echo360, enables the University of Toledo to deliver courses using a full range of instructional methods – from flipped classes, personalized learning, online courses and more. Here are a few of the ways the University of Toledo uses Echo360. A Robust Recording Solution. Toledo leverages the Echo360 SafeCapture HD appliance and personal lecture capture software to reliably support 25 completely online programs plus an additional 400 online courses. Reaching Non-Traditional Students. Both adult and part-time students have convenient and efficient ways to access their courses and earn their degrees. Real-time Feedback. Instructors use Echo360 discussions to gauge student comprehension of core topics, giving them flexibility to adjust their teaching based on student progress. Serve Active Duty Military and Veterans. As a “Military Friendly” institution, the school offers active duty military personnel the option to continue their degree programs even while deployed overseas. Read more about how the University of Toledo uses Echo360 to improve student retention and success.